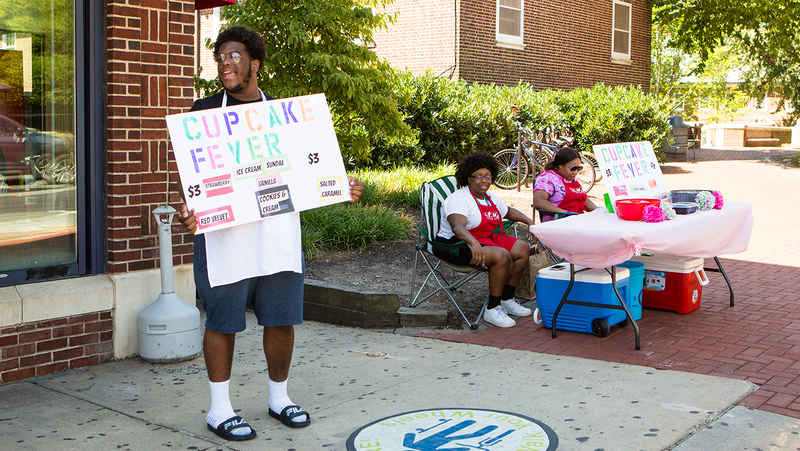 Pop-up businesses created by local high school students took over Main Street in downtown Newark this summer, as part of the EntrePrep Summer Institute’s “Business-for-a-Day” program. From July 15 through July 20, a mixture of sophomore, junior and senior high school students received intensive instruction through EntrePrep on how to run their own businesses and think like entrepreneurs. Students then used their newfound skills to create products and services, write business plans and gain hands-on experience running small enterprises. The EntrePrep program, run by the Center for Economic Education and Entrepreneurship (CEEE) at the University of Delaware’s Alfred Lerner College of Business and Economics was financially supported by Barclays, TD Bank and the New Castle County Vo-Tech School District. The students joined the program from various high schools in the region, from Delaware’s Hodgson Vo Tech, Delcastle Technical High School, Thomas McKean High School and Appoquinimink High School, to Virginia’s Monacan High School and Pennsylvania’s Unionville High School. Down the street from Cupcake Fever was Express Photography, a photography and string art business created by Raven Brooks and Erandy Cruz, both rising juniors from Delcastle. Their business served a customer base of art and photography lovers of all ages and interest levels, with profits going back into purchasing supplies for their business. The students learned many lessons in business during the program, particularly that, “There’s a lot of work to be done, like getting business permits,” according to Cruz. Foxgloves, a musical group made up of Jacob Gonzalez, Lex Archer and Devin Saienni from Delcastle, sold shirts and stickers to support suicide awareness charities. Archer and Saienni, returning EntrePrep participants, wanted to improve upon their music theme from the previous year, serving a customer base of people affected by depression and mental illness. For many of the students, like Gonzalez, who hopes to own a media group company someday, EntrePrep was a stepping stone towards their ambitions. The program allows the students to get creative, collaborate together and put their future goals of entrepreneurship to task. Through the “Business-for-a-Day” process, teams learned valuable lessons about outcomes versus expectation. The Greet Mates team found that, “Despite having a target audience of women, everyone has been buying our products on Main Street.” This team planned to give back to the program that helped them, with the day’s revenue from Greet Mates going to scholarships for students who want to participate in EntrePrep in the future. M&T Marketing, another student business, was founded by rising seniors Vymir Thomas of Thomas McKean and Jonathan Meekins of Monacan. The team provided marketing and advertising services for the other businesses participating in EntrePrep. Thomas credits EntrePrep for changing his mindset toward business ownership, especially running a small business. His business partner, Meekins, agreed, adding that, “we love helping others and talking to people.” They too planned to donate their business proceeds to the EntrePrep Summer Institute. Another venture was Business for a Cause (BFAC), a handmade jewelry business run by Caroline Sherman and Alyssa White from Appoquinimink. They planned for revenue from their sales to go to Autism Speaks and Juvenile Diabetes Research Funding, charities very dear to the team.